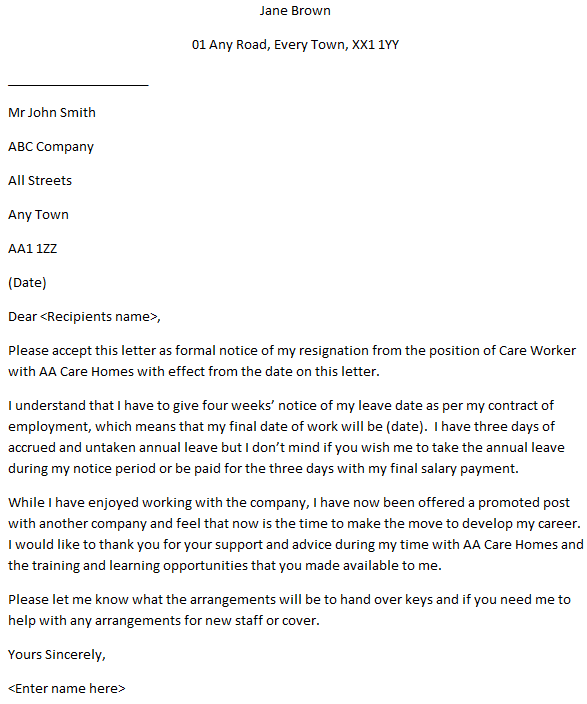 Care Worker resignation letter example. Use this example if you are going to leave your Care Worker job gracefully. You should amend this letter sample before sending it to your employer. Please accept this letter as formal notice of my resignation from the position of Care Worker with AA Care Homes with effect from the date on this letter. I understand that I have to give four weeks’ notice of my leave date as per my contract of employment, which means that my final date of work will be (date). I have three days of accrued and untaken annual leave but I don’t mind if you wish me to take the annual leave during my notice period or be paid for the three days with my final salary payment. While I have enjoyed working with the company, I have now been offered a promoted post with another company and feel that now is the time to make the move to develop my career. I would like to thank you for your support and advice during my time with AA Care Homes and the training and learning opportunities that you made available to me. Please let me know what the arrangements will be to hand over keys and if you need me to help with any arrangements for new staff or cover.